Home All RayZor Sunglasses Rimless Sunglasses VENTZ: RAYZOR WHITE FRAMED SPORTS SUNGLASSES WITH A 1 PIECE VENTED BLUE / GREEN IRIDIUM MIRRORED ANTI GLARE LENS. VENTZ: RAYZOR WHITE FRAMED SPORTS SUNGLASSES WITH A 1 PIECE VENTED BLUE / GREEN IRIDIUM MIRRORED ANTI GLARE LENS. Lightweight White Frames Manufactured from a Shatterproof Polycarbonate Compound, With Lime Green Rubber Head Grips and a Lime Green Nose Pad. RayZor Sunglasses & Goggles are guaranteed to absorb 100% of harmful UVA & UVB Rays and All our Sunglasses & Goggles meet CE European UV protection lens standards. Each Pair Purchased Will Be Despatched With A Free RayZor Micro Fibre Carry Pouch and Lens Cloth. Please note we no longer despatch our sunglasses in a presentation box. As part of our Green Policy, to reduce packaging and waste, we have taken the decision to despatch our products without the presentation box. If you must have a presentation box we can arrange for one to be included. As part of a feasibility study into how this would affect our customers, we had no reported damages in a 3 month trial period. This is most likely a sign of how robust our products are. Should any product arrive damaged please let us know and we will resolve accordingly. 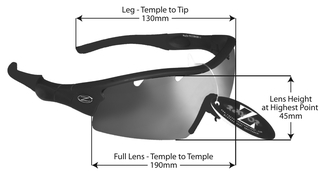 VENTZ:.... RAYZOR BLACK FRAMED SPORTS SUNGLASSES WITH A 1 PIECE VENTED SMOKE MIRRORED ANTI GLARE LENS. VENTZ: RAYZOR WHITE FRAMED SPORTS SUNGLASSES WITH A 1 PIECE VENTED BLUE IRIDIUM MIRRORED ANTI GLARE LENS. WINDSHIELDZ: RAYZOR BLACK FRAMED SPORTS SUNGLASSES WITH A CLEAR YELLOW LIGHT ENHANCING ANTI GLARE LENS. VENTZ: RAYZOR BLACK FRAMED SPORTS SUNGLASSES WITH A 1 PIECE VENTED CLEAR YELLOW LIGHT ENHANCING ANTI GLARE LENS.